St. Clair County Community College provides a solid educational foundation to help students pursue career goals in any field. There are many ways to earn college credit at SC4. Students may choose to obtain transfer credit toward a four-year degree, earn an associate degree in a career-related area, or obtain a certificate that can be applied toward a degree program while preparing for employment. Whatever students choose to study, they are urged to plan their program with an SC4 advisor. Programs of study fall into two major categories − transfer and career. Transfer programs are designed to prepare students who plan to transfer to four-year colleges and universities after completing their coursework at SC4. Associate in Arts: intended for students who plan to transfer to a four-year university and pursue a program in a non-STEM (Science, Technology, Engineering and Math) field. Associate in Science: intended for students who plan to transfer to a four-year university and pursue a program in a STEM (Science, Technology, Engineering and Math) field. Associate in Business (transfer): intended for students who plan to transfer to a four-year university and pursue a program in a business-related field, such as finance, accounting, marketing or management. These programs prepare students for direct entrance into business or industry without having to continue on to other institutions of higher education. The sequence of classes listed under each program is a suggested sequence only and is subject to change without prior written notice. They are designed to prepare students for entry into a specific job-related field, for advancement in a current job, or for making a career change. Many career courses and programs will transfer to other colleges and universities. See an SC4 advisor for additional information on articulation and transfer agreements. Many students come to college undecided about their future career. These students often begin by pursuing a program of study designed to earn basic credits, allowing them to make progress while they explore their options with career guidance experts at the college. A general education degree may be an option for students who have accumulated credits from multiple colleges and universities; see an SC4 advisor for information. 6 - 8 cr. hrs. Assoc. in Gen. Education (AGE) 3 credit hours 3 credit hours 3 - 4 cr. hrs. * PS 101 - Introduction to Political Science meets 3 credits of Social Science credits as well as the Group IX requirement. ** SPC 101 - Speech Communication or THA 105 - Oral Interpretation meets 3 credits of Humanities credits as well as the Group VI requirement. Group II. Humanities: Literature (English 201 or above), modern language, speech, art, communication design, music, theatre, philosophy, HIS 101 , HIS 102 . Students pursuing the Michigan Transfer Agreement (MTA) stamp should consult the Graduation Worksheet as Humanities courses applicable to the MTA are limited. Group V. Mathematics: MTH 102 or higher may be applied to degree programs; consult a program of study for its specific mathematics requirement. Students pursuing the Michigan Transfer Agreement (MTA) stamp should consult the Graduation Worksheet as Arts and Science degrees require specific math courses. Group VII. Computer Literacy: CIS 115 - Microcomputer Applications for many programs; consult individual program guides for exceptions. Group VIII. Writing: ENG 101 - English Composition I or ENG 101H - Honors English Composition I and ENG 102 - English Composition II or ENG 102H - Honors English Composition II or OA 225 - Business Communications . Students pursuing the Michigan Transfer Agreement (MTA) stamp will want to take ENG 101 and ENG 102 (Honors courses are acceptable). Computer Literacy - is the ability to use a computer at a level appropriate to a student’s academic and career needs. Critical Thinking - is an active process of carefully examining our own thinking and the thinking of others. Global Awareness - is the recognition of the importance of a global perspective in order to understand the diversity of cultures in world nations. Culture is defined as a complex whole that includes knowledge, belief, art, law, music, language, medicine, economics, customs, and any other capabilities or habits acquired by individuals as members of society. Government and the Political Process - is the study of the theory, organization and functioning of government and political systems. Mathematics - is the logical study of shape, arrangement, quantity and space, and their inter-relationships, applications, generalizations and abstractions. Oral Communication - is the process of effectively transmitting and receiving ideas and information in a variety of situations. Writing - is the process of effectively selecting, developing, arranging and revising one’s own ideas and those of others. The process requires students to compose ideas in a variety of written forms for a variety of purposes and audiences. Complete the specific certificate program requirements as listed in this catalog. Complete a minimum of 30 credit hours 100-level or higher (credit hour requirements vary by program) with a GPA of 2.000 or above. Complete a minimum of 10 credits at SC4 or through the Michigan Colleges Online (MCO). 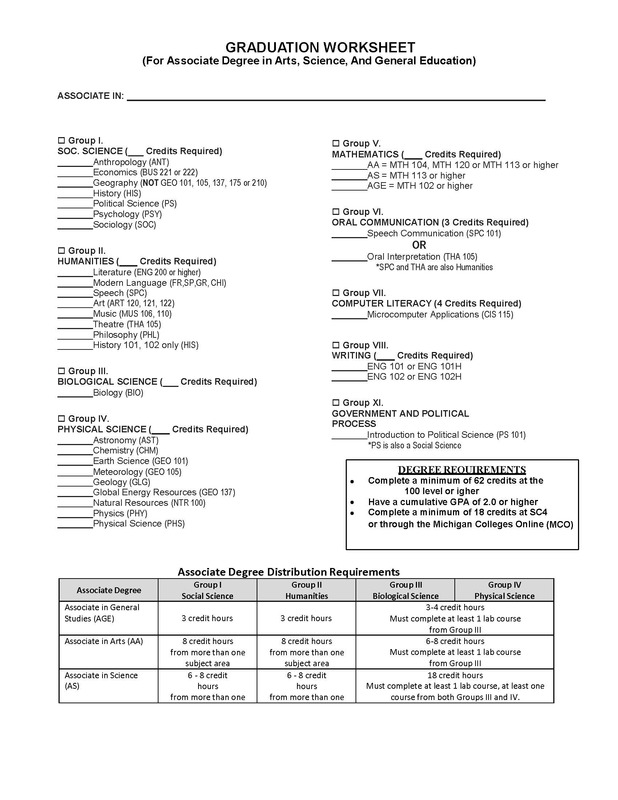 Complete the specific associate degree program requirements as listed in this catalog. Complete a minimum of 62 credit hours 100-level or higher (credit hour requirements vary by program) with a GPA of 2.000 or above. Complete a minimum of 18 credits at SC4 or through Michigan Colleges Online (MCO). NOTE: Classes with a designation of less than 100 (e.g. MTH 075 ) cannot be used for graduation credit. These classes may not transfer to other colleges and universities. Click the link to view the Graduation Worksheet (this worksheet is designed with MTA completion in mind). SC4 is a member of the statewide transfer agreement between community and four-year public colleges and universities of Michigan. The Michigan Transfer Agreement (MTA) helps simplify the transfer of credit for SC4 students. The agreement stipulates that 30 semester credit hours of 100 level and above, compatible, general course work will be granted smooth transferability to participating institutions of higher learning. Credits will be awarded towards a student’s general education requirements. Note: Students must earn a minimum 2.000 GPA in ALL MTA courses. Students whose completed MTA coursework meets the above criteria, but does not add up to 30 credits must take additional MTA-approved coursework to meet the 30 credit minimum. Click here for specific course options by MTA requirement. For a list of senior colleges and universities that have signed the Michigan Transfer Agreement, visit www.macrao.org. Meet at least once per semester with an SC4 advisor before selecting courses. Your advisor can help you choose classes that are best suited for transferring to your intended four-year school. Contact your intended four-year school to ensure you are aware of/understand all deadline dates related to applying for admission, housing, scholarships, etc. When applying to transfer, submit an official SC4 transcript. Visit www.sc4.edu/transcripts to learn about transfer options. Inquire about transfer scholarships in the SC4 Financial Aid office and/or by contacting your intended four-year institution. High school students should contact the counseling office at their local technical education center to obtain the most updated information regarding the articulation of credits to the college. The St. Clair County Community College Honors Program is designed to satisfy the needs of students who are hard-working and self-motivated, are curious and appreciate exploring a topic in depth, and enjoy strong interaction with instructors and fellow students. A student may earn an Honors degree in any associate degree program. Be enrolled at St. Clair County Community College. Complete the Honors Program application form. Forms are available in advising or online via the SC4 Portal, Student Resources tab (click on Academics link). To remain in good standing in the honors program, a student must maintain a 3.000 overall GPA and receive at least a “B” in each honors class. To receive the honors associate degree, a student must receive at least a grade of “B” in four different honors courses and complete all other degree requirements with an overall GPA of 3.000 or higher. If a student falls below a 3.000 GPA or receives less than a grade of “B” in an honors course, he/she will be placed on program probation for two semesters. During those two semesters, the student may take honors courses, receiving a “B” or better in each, and must regain an overall 3.000 GPA by the end of the probationary semester to remain in the program. If the student received less than a grade of “B” in an honors course, he/she must retake the honors course or designate a “replacement” honors course during the probationary semesters. If the probationary student fails to regain an overall 3.000 GPA after two semesters or fails to obtain a grade of “B” in a repeated or replacement honors course during the probationary period, he/she will be dropped from the honors program. If no honors course suitable to the student’s curriculum is available during the probationary period, a one-semester extension can be requested by the student. For good cause, the director, with the consent of the Honors Committee, will be permitted some discretion in the application of these guidelines. Any student who wishes to withdraw from or is removed from the honors program may seek a regular associate degree. SPECIAL NOTE: An honors option is available for non-honors courses. This option course can replace regular honors courses. Provided the instructor is willing, the option would involve some special work within the regular course that the student, the instructor and the honors director agree is acceptable.